Immortal: Curse of the Deathless is a fantasy novel bursting at the seams with an intricate world waiting to be discovered. What was the inspiration that drove the development of the world Asher lives in? Immortal started as a short story thought experiment: I wanted to try integrating a character’s internal thoughts into the story, as well as (at some points) speak directly to the audience. After I started writing, I knew fairly quickly that Asher’s story required me to write something approaching “book” length. So I started world building and writing character descriptions, and Immortal: Curse of the Deathless was the product of that. It definitely is a little rough around the edges (I’m in the process of producing another edition to clean up egregious editing errors), but that was part of its charm. Asher is an unfiltered character, and while his story is one that won’t appeal to everyone, it’s one that I truly enjoyed writing. If you look closely, you may find that I worked in satire— about icons and religious practices, while also de-sanctifying the immortal. One of the guiding notions of Asher’s development is my annoyance about the peril main character’s are put into throughout the regular course of a novel— danger which, if the story is to continue, can never truly put the MC in danger. Creating an immortal character was my way of making a point about this trend. Asher is a funny and well developed character. Did you create an outline for his character before you started writing or did his characters personality grow organically as you were writing? Asher’s personality is a permutation of my own, and so a large reason he comes off as so well-developed from the get-go is that I’m fairly well developed as a person myself. That said, as a character he did grow organically (along with his character description) and I did write a fair amount of descriptors for the character even when I thought I was writing a short story. I think any writer should write what they know best first— with the caveat that they should push themselves to develop their style and create better content with each publication. When I wrote Immortal, I was sticking to a fairly known style that came with a limited viewpoint, but a lot of interesting potential. With my latest publication, I pushed those boundaries and created something outside my usual genre, with a different character archetype while shifting my writing approach. In the Fae Realm, Asher gets caught up between two feuding noble houses, Summer Court and Winter Court. What were the driving ideals behind these houses while you were developing them? The Summer Court and Winter Court are two sides of the same coin. There is an obvious patriarchy in Winter, and the matriarchy of Summer opposes it. Although both Courts are inherently dangerous (especially for outsiders), Summer is, like the season, warmer and more welcoming. Winter is a closed fist, and it rules by force. Its manipulations are sharp, jagged edge. Are you writing a second novel as a follow up to Immortal: Curse of the Deathless? If so, when is that book due out? A great question. Yes, Immortal: Reckoning is the sequel to Immortal: Curse of the Deathless. The series title is The Immortal Chronicles, and I’ve laid out my projected publication dates of the following two books on my website homepage (along with all my other future publications for most of the next year)>>> www.derekedgington.com. Immortal: Reckoning is due out in November 2016, and Immortal #3 will be published on May 7, 2017 (exactly a year after the first book was published). Asher Hearst is a college student, and the closest thing he’s got to a superpower is his ability to take a punch. Basically all he has going for him is an edgy sense of humor– and, of course, that he can’t die. 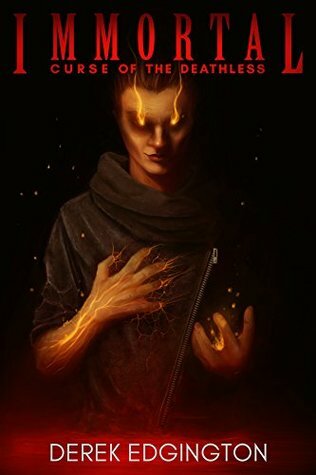 As a small-time fixer, he’s about to field a job request best left to the pros, because once he gets involved with witches and the supernatural, there’s no turning back. While Asher becomes immersed in the secret world of the supernatural, he makes few allies and some very powerful enemies. At least traveling across space and time will bring him some unexpected romance, right? “Immortal: Curse of the Deathless” is a humorous, action-filled story with gritty, sometimes horror-inspiring elements. Over its three parts, the book spans multiple worlds: a modern, urban city of the 21st Century, as well as Tír na nÓg, a land that’s home to the Fae (Sídthe) from classic Celtic Mythology.